This is the pre-publication version which was subsequently revised to appear in Creation 30(3):54–55. Photo Wikipedia.org, Creative Commons Attribution 2.5. 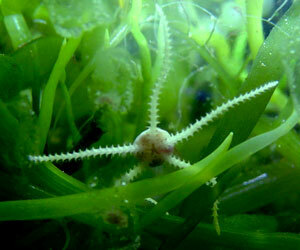 The brittlestar or serpent star is similar to a starfish, but has five waving arms attached to a disc. Although it doesn’t seem to have any eyes, it has a puzzling ability to flee from predators and catch prey. And it even changes colour from dark brown in daytime to grey at night. They found that the brittlestar species Ophiocoma wendtii secretes tiny crystals of calcite (calcium carbonate, CaCO3 ) which formed ‘spherical microstructures that have a characteristic double-lens design’, and ‘form nearly perfect microlenses’. The array of microlenses focuses light a small distance into the tissues (4–7 μm) where nerve bundles detect the light. Brittlestar species that were indifferent to light lacked these lenses. Dr Aizenberg used much easier-to-understand language when explaining to reporters the nuts-and-bolts significance of what the team’s findings actually mean. For example, she said that the visual system of lenses in the brittlestar is far superior to any manufactured lenses. Scanning electron micrograph (SEM) of a part of the skeleton of a brittlestar Ophiocoma wendtii (Ophioroidea, Echinodermata). 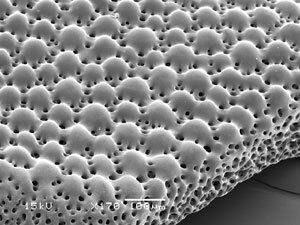 The lenses appear opaque because calcite reflects the electrons used in the SEM microscopy, whereas calcite is transparent to light. Huh? ‘Thanks to evolution’ these creatures have ‘beautifully designed’ microlenses acting ‘in concert’ with other (incredibly specialised) parts of the body? This evolutionary ‘explanation’ is totally vacuous—where is even a proposed sequence of small changes guided by natural selection at every step, let alone one demonstrated in the fossil record? Aizenberg, J., Tkachenko, A., Weiner, S., Addadi, L. and Hendler, G., Calcitic microlenses as part of the photoreceptor system in brittlestars, Nature 412(6849):819–822, 2001. Return to Text. Abraham, J., Eyeless Creature Turns Out to Be All Eyes, Access Research Network, 12 September 2001. Return to Text. Sambles, R., Armed for light sensing, Nature 412(6849):783, 23 August 2001 (commentary on Ref. 1). Return to Text. Roach, J., Brittle Star found covered with optically advanced eyes, National Geographic News, 22 August 2001. Return to Text.